There is a lot written in chapter 35 about cities of refuge for someone who kills another by accident. Imagine how radical this idea would have been. It is the beginning of mercy and grace. Suppose you are working in the fields or in the forest and a tree falls and kills your co-worker. Family and tribal honor would be at stake and the entire family would be out for revenge. Consider the long family feud in Kentucky of the Hatfield’s and the McCoy’s. How many years and how many lives were lost over this feud? On death begets another, and then another. When does it stop? The LORD says to establish cities where people can go for refuge, to seek sanctuary and in the end salvation. This principle will be the foundation of what God is offering through Christ. Have you ever felt like because of bad judgment or circumstance beyond your control, you wish you could find sanctuary? Do you know someone who needs sanctuary from everyday life? How would you define Sanctuary? The firstborn – which was always thought to be the best and the favored – always belongs to God; so instead of giving the firstborn of Israel to God in sacrifice, the tribe of Levi was “given” to God as in place of each of the firstborn sons of Israel. However, there were 22,273 firstborn sons in Israel; and there were only 22,000 Levite males (Leviticus 3:39). The extra 273 were given a monetary value (five shekels for each one individually), and the money was given to the tabernacle as redemption money. The number of firstborn sons is low if accounted for all the nation; it would mean that only one in 27 sons were firstborns – an unlikely percentage. It is more probable that the 22,273 firstborn sons were those born in the thirteen months of the Exodus. Does this sound at all familiar? What can we learn about the purpose of God through all these Law, rules and rituals? The passage in Leviticus reminds me of this passage in Genesis when God walked with us in the Garden. Could it be that God is trying to bring us back to that unity where we walk with God again? Is the purpose of all these regulations to set the boundaries where we can walk with God without fear, guilt, or shame? Leviticus is filled with all kinds of regulations about guilt offerings, burnt offerings and cleanliness rituals. God is trying to remove the guilt and shame we all feel yet cannot quite be free from. Imagine working all day in the garden, hands dirty, body sweaty, and hair matted against your forehead. But there’s no way to get clean. So you pull back the covers and crawl beneath the sheets. Does that sound comfortable and cozy, or nasty and irritable? I have to think the latter. God is providing a way for us to come clean. To feel comfortable around God and each other. To know that the inside is able to heal and come out of the shadows and know who God really is and trust His heart enough to seek forgiveness and reconciliation. Leviticus has a lot to teach us about the heart of God. Have you ever taken on more than you could chew? What your eyes ever bigger than your stomach? Did God ever ask you to take on a task that was simply beyond your ability? We often think so and I think Moses felt like it too. Remember these were slaves he was leading. They weren’t used to making decisions let alone taking on the military powers that resided in Canaan. So Moses, it will not be you who fights the fight, but God’s power. You just have to follow through. The fact that God will not travel with them highlights the holiness of God. As Christian we all have the ability to speak to God like this. To have the kind of relationship that Adam and Eve shared in the Garden. Prayer opens the door to the Kingdom of God, our true home. When Moses asked to see God he was not able to see God’s glory. The Glory of God is expressed in Jesus. If you want to see and experience the fullness of God’s glory, know and experience the person of Jesus Christ. Second version of the 10 Commandment. This version is different from the version encountered in Chapter 20. Why? What is being revealed here than is different from the original? When I met my first friends from Texas, I was introduced to a charming people with a unique turn of phrase: “fixin’ to”. My new friends were two very attractive and sophisticated young women from Broadway Baptist Church in the Dallas area, one of whom was performing an impromptu skit with some other friends on our weekend retreat. Her line was ” Doctor, doctor come quick, my daddy is fixin’ to die!” That line is all I remember from the skit except that the whole thing ground to a halt while the audience and the cast broke into uncontrollable laughter. Exodus 28 and 29 are all about preparing the sons of Aaron for the priesthood, and all of that preparation was meant to lead up to one glorious visitation of Yahweh before the tabernacle. God did not just show up, He ordered that preparations had to be made, and not just any activity would suffice. These were very specific instructions that had to be followed BEFORE His arrival. Does this not make you wonder whether we are making sufficient preparations for the visitation that we seek? Are there conditions of the soul that He requires of us in order for His presence to meet us at the place prepared for Him? Is there not a requirement of worship that precedes entering his courtyard? As for me, I will be giving some more thought to ‘fixin’ to meet with the Almighty. I feel compassion for Moses. Here he is in the Exodus story doing everything that God commands and nothing is turning out well for him. That seems so backwards. From our way of reasoning, if you do what is right, if you obey God’s call, it should go well for you. But life does not conform itself to our belief system. Life does not bend for us. Life is difficult. Moses was homeless, powerless, and indigent. Did you ever wonder where Moses lived during all this? How did Moses support himself? He did not have a salary. He did not have an inheritance. Moses had no income. The time that he lived with his in-laws ended at the burning bush. Who supported this prophet’s lifestyle? Was it Miriam or Aaron who paid for his food and shelter? Was this why they felt they could criticize him so openly later on in the desert? Jesus was homeless too you know: “The Son of Man has no place to lay His head…” and when I think about it, so was Elijah, particularly after the massacre of the priests of Baal. How can you balance this inequity? 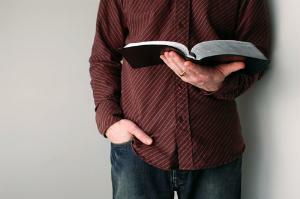 Should we not see people who prosper because they follow their calling from God? Moses, Elijah and Jesus all confronted their communities with the words of God but He did not protect them from the retaliation that ensued. Then to top it all off the people did not listen. Pharaoh was the quintessential blockhead. Everything Moses said was God’s word, and everything Moses did was backed up with a miracle. But still he did everything that he could to mollycoddle Moses into changing rather than recognizing the wisdom of subjecting himself to the will of a Supreme Being. All the while Moses continues to obey, and continues to suffer for it. Even beyond the plagues and Passover and the parting of the Red Sea, Moses does everything right but his world is turned upside down by the responsibility of his call and the radical change that happens because of God’s plan. Right up until that one little emotional outburst with the rock when God’s death sentence was pronounced. Even Moses had not earned a special place in God’s eyes so that He could wink at sin and let it go without consequences. None of his obedience mattered when it came down to disobedience. You and I have both seen the ministers whose lives have been devastated because of disobedience. Perhaps they thought about being special or exempt because they followed God’s call, or perhaps they just had an emotional outburst, or maybe the heart is just wicked. But my question is: Where are the ministers who suffer for doing what is right? Are they not cast aside into a ditch of irrelevance in favor of those who can play the political games and who succeed at marketing attractiveness over the long term? Where are the men and women who will not compromise? Where are the prophets who declare “thus saith the Lord” and then face the backlash without giving up? Are there any who remain who can face the wrath of a culture that focuses on the humanity but discards the divinity? Where are the deliverers who will not stop until the deliverance is complete? Are there any who remain in the ranks of the ordained? Surely there must be those who do live “just as the LORD commanded them”. The Master God told Elijah that He had reserved for Himself people who refused to bow their knee at the cultures mandated no-god Baal. In the book of Ezekiel chapter 48 God remembered the descendants of Zadok “the Zadokites who stayed true in their service to me and didn’t get off track as the Levites did when Israel wandered off the main road…” and of course Jesus spoke to his disciples as to “those who lost…for my sake” in a promise set in the future. But none of the disciples have shown us that life becomes easier. I wish they would, but no amount of wishing will make it so. All of them died martyr’s deaths except the exiled John. No amount of fantasy can change reality. Life is difficult, and obeying God makes it even more difficult. So the question remains. Why bother obeying God at all? If peace and prosperity does not come from following the beautiful plan that the Father has laid out for our lives, why not just listen to the heathen “eat drink and be merry for tomorrow we die”? I can think of only two reasons today. The first is because only God is good. To follow any other course of life is self-destructive because it is by definition wicked and evil. Refusing to follow God’s good rule is socially destructive because self-interest breeds communal degradation and rampant lawlessness that consummates in chaos. Just look at the impact that our sexual freedoms have had on families and you can see what I mean. The second is because human life is not about human life. We are not here to pursue comfort, ease and prosperity, despite the swan song of materialism. Human life is about being part of the answer that God gives every time we pray in the manner that Jesus taught us. The lesson of Moses is that Exodus is not about Moses, it is about God’s terms of deliverance and Kingship over His people. It is about focusing on how we are to interact with God first (have no other gods before me) and how we are to live with others (thou shalt not…). Jesus made it clear that the whole point of human life is that God sets the standards on how we are to love God with all of our heart, soul, mind and strength, and love our fellow humans the way that we treat our own bodies, carrying one another’s burdens and so fulfill the love command. Remember that He said if we try to save our own lives we will lose them, but if we lose our lives for His sake, we will find our life in Him. Look up and see the prophet in your midst, those suffering for living and speaking God’s bold word of truth. Do not be frightened by their suffering, but give unto them, and you will not fail to receive the prophet’s reward. Remember, your life is not about you. Joseph had integrity even in prison. Betrayed by his brothers and thrown in prison because of Potiphar’s wife, Joseph still uses his spiritual gifts to help those that needed his help. In time, Joseph’s integrity will be remembered because of an act of kindness two year earlier. We cannot always know the ramification so our actions and we certainly won’t always be applauded for doing good. Sometimes just the opposite. But we know that as followers of Jesus we must true to our nature, but salt and light in a dark and weary world. One of my favorite quotes is by William Penn, founder of Pennsylvania! Pharaoh dreams the same dream twice to provide this an important message and not as Scrooge would say, “a bit of undigested beef.” In a moment of crisis they remember Joseph. Isn’t this typical. We don’t remember God until we’re in crisis mode. The story of Israel is one of abundance leading to idolatry leading to crisis. Will we ever break this cycle? Joseph stand before Pharaoh, the monarch of all Egypt and might easily have taken the credit, the reward, and the fame for his wonderful ability to interpret dreams. BUT HE DOESN’T. Even though he is in prison and has no prospects yet of release, he praises God for the gifts he has. When was the last time you praised God for the work of your hands, mind, or heart. Believe me when I say, I can’t preach! But God can through me! Mother Teresa once said she was nothing but a little pencil in God’s hand writing a love letter to the world. I like that! Joseph tests his brother by asking them to bring Benjamin, the youngest who Joseph had never seen. I found it interesting that Joseph imprisoned the brothers for three day. And on the third day brought them out to offer them a solution. Redemption comes after three days.